Technology is completely changing the way people approach education. The increase in mobile connectivity is creating access to education for countless students that would otherwise be underserved or ignored by traditional education means. Mobile learning is a $37B industry and UVII is a mobile-first education platform that sits at the intersection of education, technology, learners, and educational institutions. Through its technology platform, the company offers seminars and courses to learners and also focuses on the B2B side by empowering educational institutions the means to assess the effectiveness of their digital programs through real-time video response and assessment tools to ensure students are learning. AlleyWatch caught up with founder and CEO Kimberly Gray about creating a platform that will make people entirely rethink the purpose of their smartphone. Tell us about the product or service that UVII offers. UVII is mobile-first education enabling students and self-learners to access courses from educational institutions and speaker seminars with professors, industry leaders, and influencers on their mobile device. We provide video response and assessment tools that enable video commenting and video surveys to help educational institutions prove their students are learning. Has there been any data to support that mobile-first learning leads to better outcomes for students? According to Cisco, 80% of what we learn as youth is visual. 86% of your mobile media time is spent on app. Value in video content has increased each year since 2007. 68% of educators believe that video content stimulates discussions and 66% believe video increases student motivation. 61% believe video is preferred by students. According to Cisco, 80% of what we learn as youth is visual. 86% of your mobile media time is spent on app. The value in video content has increased each year since 2007. 68% of educators believe that video content stimulates discussions and 66% believe video increases student motivation. According to Forbes, millennials are willing to spend up to $300 dollar per month on self-improvement which UVII targets through microlearning and speaker seminars. UVII takes online learning to your mobile device with a familiar social interface. UVII’s one-touch utility patent-pending video response tools (video commentary and video survey) are agnostic LTI (Learning Tool Interoperability) API plugins for LMS (Learning Management System) MOOCs (Massive Open Online Courses) and University Portals. Easy access, saves time, video respond to collaborate real-time faster more efficiently and spending less money. 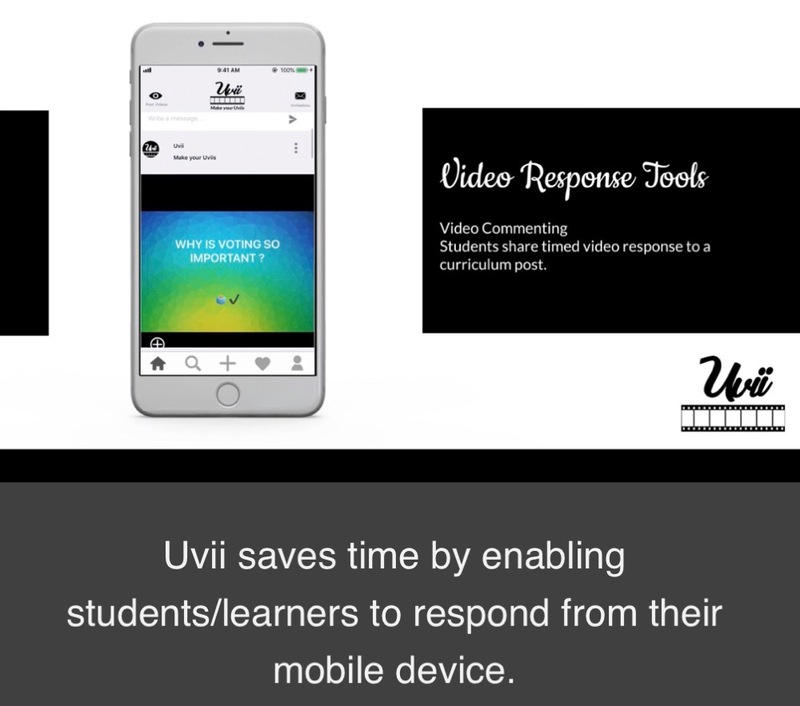 UVII helps institutions assess how well students are learning beyond standardized testing with timed video surveys. What market does UVII target and how big is it? Education is the second largest industry sector in the United States alone. A Total Available Market (TAM) of $6T. The annual E-Learning Serviceable Available Market (SAM) is $275B for institutions, students, and self-learners. UVII’s market addresses M-Learning worth an estimated $37B and Personal Development valued at $11B respectively with 72% of millennials seeking self-improvement learning. We are launching with US K-12 and Higher Ed representing 77M students, 5.3K colleges, and over 1.4K school districts. UVII has two business models. Our B2C Model is a PAAS (Platform as a Service)- Mobile-First Speaker Seminars and micro courses on the app. UVII charges learners a tiered pricing model per seminar starting at $10. The B2B Model is SAAS (Software as a Service) plugin. UVII charges educational institutions $10/ Student per course to license our utility patent pending video response tools (video commenting and video survey) for LMS (Learning Management Systems) MOOCs (Massive Open Online Courses), Publishers and University Portals. What inspired the start of UVII? Both of my parents are retired principals in Washington DC public schools. My brother attended West Point and the entire family went to Howard University. The importance of education was instilled in me at a very young age. Globally there are 263M youth not enrolled in school and educational equality is a big problem. However, mobile first learning can fix this problem. I was inspired to create UVII to start rethinking how we educate. People learn differently, and UVII provides a way for students and self-learners to collaborate virtually, gain access to educational equality, and ignite their entrepreneurial spirit. Q1 of 2019 our focus is: fundraising for our seed round, develop and integrate patent-pending video response LTI (Learning Tool Interoperability) plug-ins for LMS (Learning Management Systems, MOOCs (Massive Open Online Courses) and university portals through a development and distribution partnership with Magic Ed Tech. In Q2 UVII will do two activations. The SAAS plug-ins to licenses and onboard with university portals and LMS provider — like Noodle Platform for High Ed graduate students and Canvas. The second activation is on the PAAS Launch on the Mobile app. Speaker Seminars and micro courses with celebrities and influencers to launch as part of a sponsored event during SXSW EDU. Here self-learners can hone their skills, access exclusive speaker seminars and respond to speakers through their mobile device only on UVII. In Spring 2019, we plan to release a UVII produced video media campaign “Pathway to Knowledge” for Medgar Evers College. We also hope to launch UVII in more institutions, including CUNY (25 Campuses across NYC) and onboard at least two LMS and MOOCs providers. When it comes to fundraising ask for money and you get advice. Ask for advice and you get money. Listen more than you speak. Michael Bloomberg. He hits on all cross-sections of tech, finance, and politics in a city that has the 9th largest economy in the world. As a progressive thinker in terms of education, I would be interested in hearing his feedback on mobile-first education and skill training for public and private sectors. I live in Harlem, and it is a community vibrant with history and a burgeoning tech hub. We want to continue to support the ecosystem here. I’ve always been an entrepreneur, and I opened the first 3D-4D prenatal photography service in Harlem called Tiny Portraits 3D Imaging. I’ve also collaborated with local community leaders and organizations like Silicon Harlem and Harlem Children’s Zone. Ponty Bistro in Harlem – I practically live there.